“We live in a universe filled with matter, with no detectable pockets of antimatter, but don’t fully understand why. 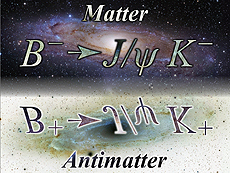 In the very early universe, matter and antimatter were created in equal abundance. As the universe cooled, the matter and antimatter annihilated each other, but left behind the small excess of matter that accounts for all of the stars, planets and galaxies in the universe today. This difference is thought to result from the slightly different ways the particles and antiparticles decayed. However, the decay rate difference predicted by the Standard Model is not nearly enough to account for the amount of matter in the universe. By precisely measuring processes that show a difference between matter and antimatter, physicists attempt to understand what caused the imbalance that led to the universe today. Most matter and antimatter annihilated each other in the very early universe, but a small excess of matter remained to form the universe we live in today. To attempt to understand this imbalance, scientists measure particle decay processes that show a difference between matter and antimatter. A recent result at DZero studied this asymmetry in the decay of a charged B meson, made of a bottom quark and an up quark, into a J/Ψ meson and a charged K meson, which involves the bottom quark decaying into a strange quark and two charm quarks. To reduce the uncertainty on the measurement, the analysis exploited the fact that the magnetic polarities of magnets in the DZero detector were systematically flipped during the decade of data collecting for Run II. Each possible source of bias in the measurement of asymmetry between matter and antimatter was carefully studied and accounted for. The final result is the world’s most precise measurement of matter-antimatter asymmetry in charged B meson decays to a J/Ψ meson and a charged K meson. The measured asymmetry is consistent with the Standard Model. While it does not indicate the presence of new physics and explain the matter-antimatter asymmetry in the universe, it is an important step in exploring this mystery. “In results published today in Physical Review Letters, the Antihydrogen TRAP (ATRAP) experiment at CERN’s Antiproton Decelerator reveals a new measurement of the antiproton magnetic moment made with an unprecedented uncertainty of only 4.4 parts per million. This is not just an impressive feat for the ATRAP team, but is also an important attempt to understand the matter-antimatter imbalance of the universe, one of the great mysteries of modern physics. “During the recent lead-proton run at the Large Hadron Collider (LHC), the Large Hadron Collider beauty (LHCb) experiment took data from collisions between protons and ions for the first time. LHCb is an asymmetric detector designed to study matter-antimatter asymmetries and rare decays involving heavy quarks. Though LHCb is small compared to the multipurpose detectors CMS and ATLAS and the specialized heavy-ion detector ALICE, it has something special: the location of LHCb close to the collision point allows it to identify particles that scatter at very small angles from collisions. ‘The detector’s unique angular coverage will enable us to study strange, charm and also beauty quark production in regions not accessible to the other experiments,’ says LHCb spokesperson Pierluigi Campana. Read all about LHCb here. “Imagine being able to ‘inflate’ an atom with a laser, then slow it down, catch it or bend it around corners. At the AEGIS experiment at the Antiproton Decelerator, Stephen Hogan of University College London and an international team of collaborators are trying to do just that. AEGIS is designed to test whether antimatter complies with the weak equivalence principle (WEP), a mathematical concept that states that the acceleration experienced by a particle in a gravitational field is independent of its mass and composition. The principle has been tested with very high precision for matter, but never for antimatter. If results from AEGIS show that the gravitational acceleration of antimatter in the Earth’s gravitational field is different to that of matter, this could provide clues to why our universe is now dominated by matter, even though matter and antimatter were created in equal amounts during the big bang. This is copyright protected, so just a couple of hints to pique your interest. “Scientists have devised a new method of cooling down antimatter to make it easier to experiment on than ever before. The new technique could help researchers probe the mysteries of antimatter, including why it’s so rare compared with matter in the universe. The new technique is focused on antihydrogen atoms, which contain one positron and one antiproton (regular hydrogen contains one electron and one proton). SPACE.com, launched in 1999, is the world’s No. 1 source for news of astronomy, skywatching, space exploration, commercial spaceflight and related technologies. Our team of experienced reporters, editors and video producers explore the latest discoveries, missions, trends and futuristic ideas, interviewing expert sources and offering up deep and broad analysis of the findings and issues that are fundamental to or understanding of the universe and our place in it. SPACE.com articles are regularly featured on the web sites of our media partners: MSNBC.com, Yahoo!, the Christian Science Monitor and others. Fermilab continues to be a great source of strength in the U.S. Basic Research Community. “One of the most puzzling properties of matter in our universe is that there’s so much of it in the first place. When new matter is created during a particle collision, an equal amount of antimatter accompanies it nearly every time. The Standard Model allows only a very slight deviation from this symmetry, and not nearly enough difference between matter and antimatter to explain the abundance of matter in our universe today. New measurements from DZero add pieces to the puzzle of matter-antimatter asymmetry. 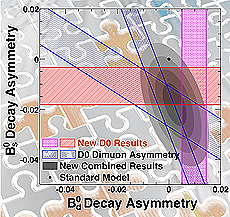 The DZero Collaboration has previously shown evidence for a greater matter-antimatter asymmetry than predicted by the Standard Model in the decays of neutral B mesons, particles that combine a bottom quark with either a down quark (Bd0) or strange quark (Bs0). Two new measurements, which focus separately on the Bd0 and Bs0, now add complementary pieces to this puzzling matter.